Tom Robichaud sent in some information on the restoration of the Jim Cheney red, white, and blue number 1. This car is in the process of restoration by Kris Trefethen of Epping, NH. Please feel free to contact him through Stephanie Trefethen or phone him at 603-679-5453. He would be more than happy to show his fine work in restoring Jim Cheney's car. Jim Cheney wins in the #1. 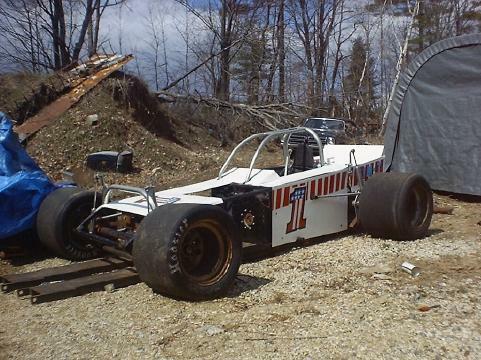 Recent photo of the Jim Cheney #1 at Rick's Rod Shop in Epping, NH. 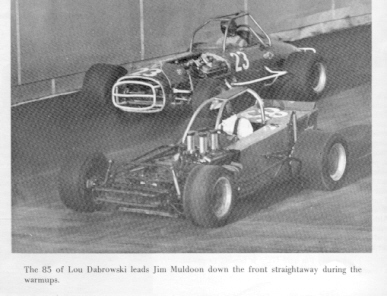 Mike Thornton writes in: "Jim bought the car from my friend Lou Labrowski. As a teenager,I got involved with the Solvay Automotive 04. Lou was a good friend of Bob Stelter, and the car was built in Lou's garage in Syracuse. The roll cage on the car is from Todd Gibsons-65-66 flintstone Flyer. 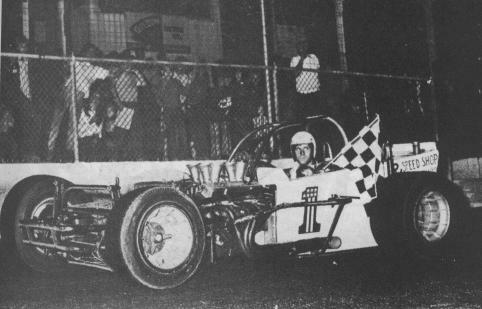 Lou bought that car from Irish Jack Murphy and ran it in 68. Also sending along a couple of scans-this was one beautiful car and one of the first "wedge" designs at Oswego." Lou Dabrowski in the 85 before it became the Cheney #1. Lou Dabrowski in the 85.